IRELAND’S JOHN EGAN is developing quite a reputation as a goalscorer. The towering centre-back only moved to Championship side Brentford in the summer of 2016 but managed to find the net four times in his debut campaign. Prior to that, he enjoyed a similarly lucrative spell in front of goal while at Gillingham, scoring 10 times in League One in just two seasons. And he’s started his 2017/2018 campaign off in much the same way. He scored his fifth goal for Brentford earlier today to put his team 1-0 up at home to Nottingham Forest. But, unfortunately for the 24-year-old, the guests rallied and scored three times between the 41st and 47th minute. Their third was scored by another Irishman with Daryl Murphy finding the net for the first time since joining Forest in the summer. Brentford did gamely put up a comeback later in the second-half and Andreas Bjelland made it 3-2 on 79 minutes. 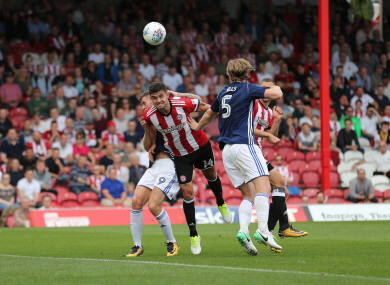 But Forest responded with a fourth minutes later as Kieran Dowell seemed to put the result out of Brentford’s reach. Neal Maupay did grab another for the home side but they failed to find an equaliser and that’s two straight defeats for them so far this season. For Forest, it’s the complete opposite and they are one of only four clubs to still have a 100% record. Email “Not bad for a centre back: Ireland's John Egan on the mark (again) in seven-goal thriller”. Feedback on “Not bad for a centre back: Ireland's John Egan on the mark (again) in seven-goal thriller”.